On December 16, JERSEY BOYS Vegas concluded its 4th and final installation of its ?Four Seasons of Kindness? campaign. The autumn initiative, held together with Sunny 106.5 and benefiting the Boys & Girls Clubs of Southern Nevada, incorporated a holiday drive which led to greater than $10,000 worth of donations of new winter clothing for teen club members. The ?Four Seasons of Kindness? 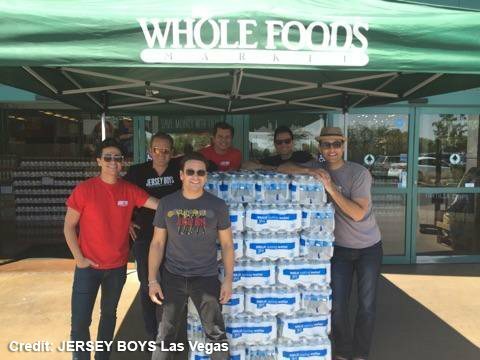 campaign was a year-long initiative carried out in celebration of JERSEY BOYS becoming the longest-running Broadway production on the Vegas Strip an in thanks for the community’s continued support of the show. Symbolic of the Four Seasons band members the show is based on, JERSEY BOYS joined with four local charitable organizations throughout 2015 to satisfy four acts of kindness that positively influenced and led towards the greater good from the Vegas community. JERSEY BOYS began the entire year-long campaign by joining up with Opportunity Village for the winter months initiative and continued with collaborations with Three Square Food Bank for spring, HELP of Southern Nevada for summer time, and came to the conclusion using the Boys & Girls Clubs of Southern Nevada for fall. The 4th and final act of kindness benefitting the Boys & Girls Clubs of S. Nevada wrapped with donations in excess of $10,000 in new winter clothing for teen club members. People from the JERSEY BOYS cast and Sunny 106.5 visited the Lied Campus to assist in distributing some of the more than 1,000 winter clothing products contributed to teens in need of assistance; the donations will be distributed among all 14 campus locations. Furthermore, on Sunday, December 13, people of JERSEY BOYS and Sunny 106.5 surprised the Figueroa family – long-time members of the Downtown Club location – in their home to provide additional holiday cheer, together with a Christmas tree from Star Nursery, gift certificates to Brio Tuscan Grille and Eiffel Tower Restaurant, and tickets to see JERSEY BOYS at Paris Vegas. The Boys & Girls Clubs of S. Nevada work to provide greater than 21,000 youth in Las Vegas, North Vegas, Henderson, Southern Highlands and Summerlin with equal access, hope and chance. The smash-hit production, JERSEY BOYS, made its Las Vegas debut in May 2008 at The Palazzo prior to moving to its current home at the Paris Las Vegas. JERSEY BOYS became the longest-running Broadway production on the Las Vegas Strip in fall 2014, surpassing notable shows such as PHANTOM-THE LAS VEGAS SPECTACULAR and MAMMA MIA! JERSEY BOYS is the #1 Rated Show in Las Vegas and the ?Must see show of the year!? according to the Las Vegas Review-Journal. The musical phenomenon JERSEY BOYS, the story of Frankie Valli and The Four Seasons at Paris Las Vegas is the runaway hit that has taken Las Vegas by storm. JERSEY BOYS is the story of how a group of blue-collar boys from the wrong side of the tracks became one of the biggest American pop music sensations of all time. They wrote their own songs, invented their own sounds and sold 175 million records worldwide – all before they were thirty. The show features hits such as ?Sherry,? ?Big Girls Don?t Cry,? ?Can?t Take My Eyes Off You,? ?December, 1963 (Oh What a Night)? and many more. Presented in Las Vegas at Paris Las Vegas, it is the same production fans all over the world have come to know and love.